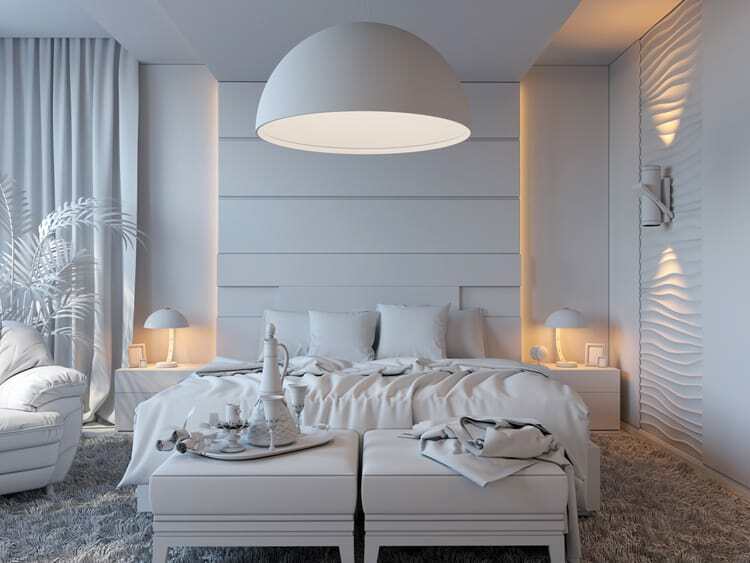 Nothing beats the simple and clean look of a white bedroom. While white is a solid foundation for almost any color scheme, we’re taking it all the way from floor to ceiling and wall to wall. The challenge is keep it from looking empty and cold. White is a positive color known for purity and perfection. Whether you lean toward romantic, modern, boho or vintage style, white is the perfect choice to create a stylish master bedroom. Doing white the right way will have you floating on cloud nine at the end of a stressful day. 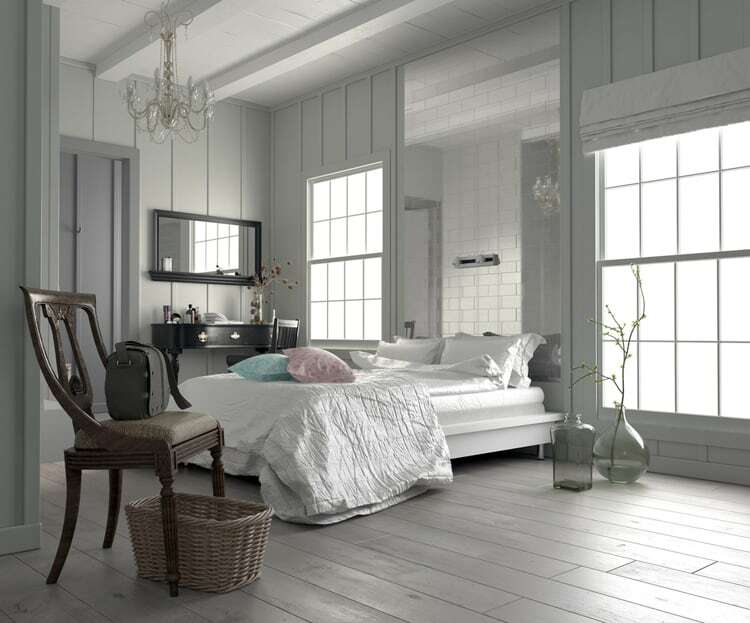 To avoid the clinical look, use a grounding color such as grey or black in the room. A mix of white and off-white in a variety of luscious textures will transform a plain white space into a warm and inviting sanctuary. This fabulous gallery of white master bedrooms will help you create a chic retreat to call your very own. While large in size, this white master manages to retain a cozy feel by layering textures and shades of white. 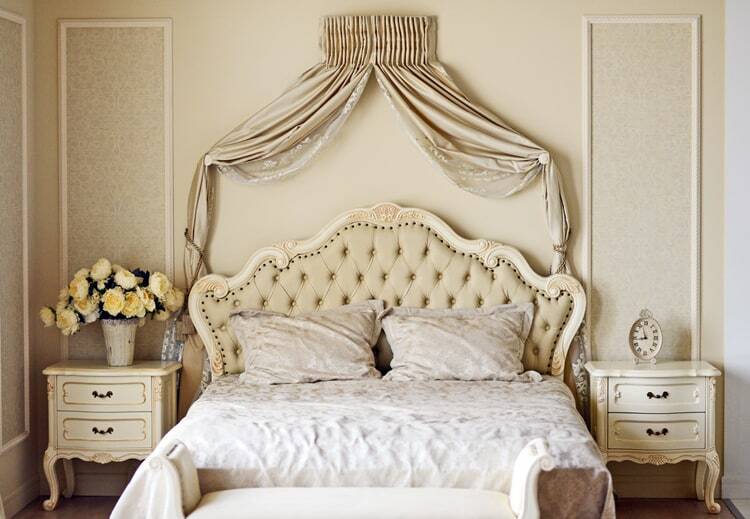 The soft tan headboard and drapes give the space a cocoon-like feel. The white shag rug, silk comforter and crisp, cotton sheets add luxury and comfort. White doesn’t necessarily mean cold and stark. 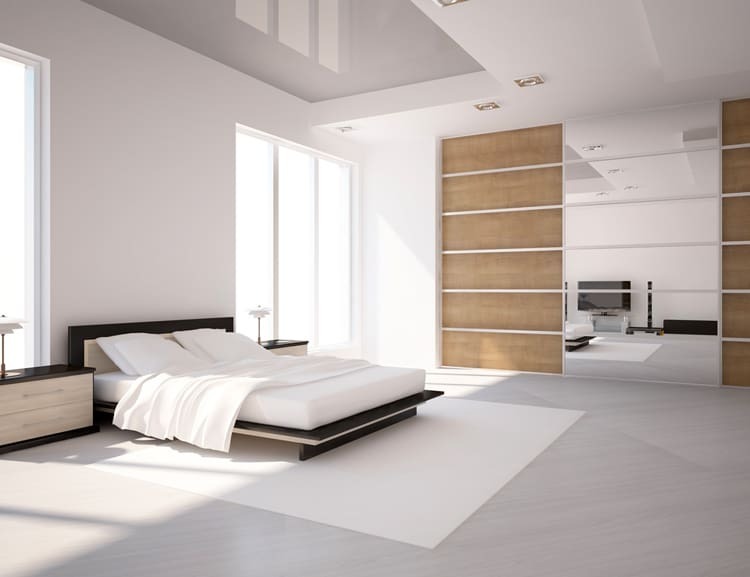 In fact, the range of white colors for a master bedroom will make your decision-making process quite difficult. Depending on the nuance, white can take on completely different looks. In this bedroom, all the fabrics and furnishings have warm undertones, giving the space a luxurious feel. For a stylish look, adding texture and pattern to a white master bedroom will take it from dull to dramatic. Louvered window shutters add a sense of pattern to the billowy curtains. Custom wire pendants give the space an industrial look. The wood beams highlighting the headboard wall add a touch of nature to the all-white room. This understated master bedroom has become the homeowner’s favorite spot to hide from the day’s distractions and stresses. Cool white walls, the beautiful, upholstered leather bed and the charcoal cashmere throw create the perfect spot for total rest and relaxation. When used with purpose, white becomes a key element of a master bedroom’s design. 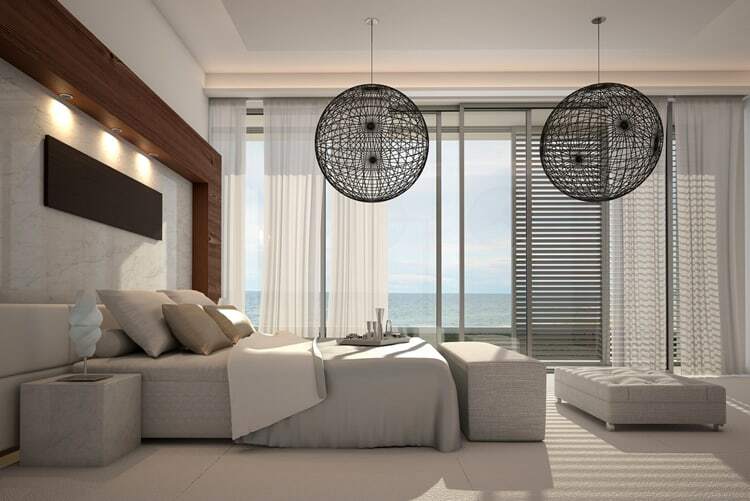 This designer highlights the room’s adjoining sea view by leaving the wall of windows unadorned and creating a sense of privacy with wispy, white bed curtains. 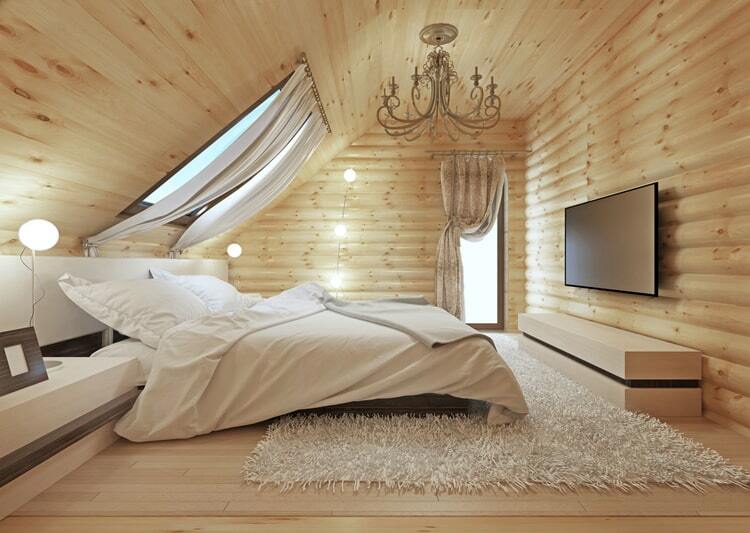 White bedding and a modern, integrated headboard create quite the juxtaposition in this log cabin master bedroom. An elegant chandelier, soft curtains and a comfy shag carpet bring luxury to this North woods getaway. Get decorating inspiration from art. 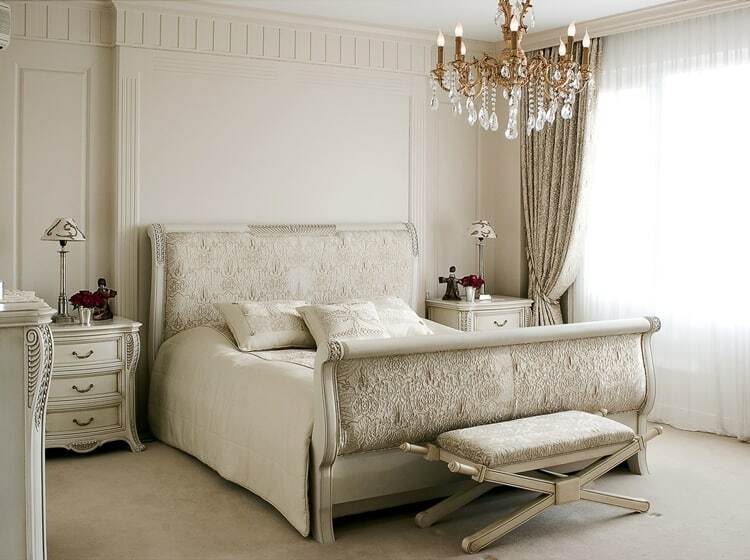 In this master everything is white, short of the owner’s collection of modern paintings that grace the headboard wall. These statement pieces add a jolt of black to arrest the eye and create a focal point. It’s counterintuitive, but one of the best ways to draw attention to architectural elements is painting them all in white and adding subtle touches of color around the room. This tone-on-tone master bedroom is soft, warm and romantic thanks to the addition of creamy touches like the bench, lamps and bedside tabletops. 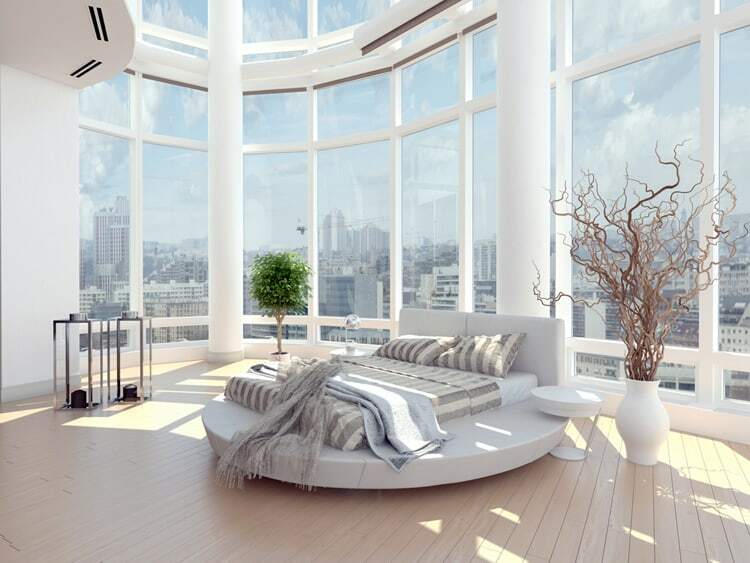 A wall of windows wraps this penthouse master bedroom, giving it personality and style. Really, the only other thing the space needed was a statement bed to complete the design. 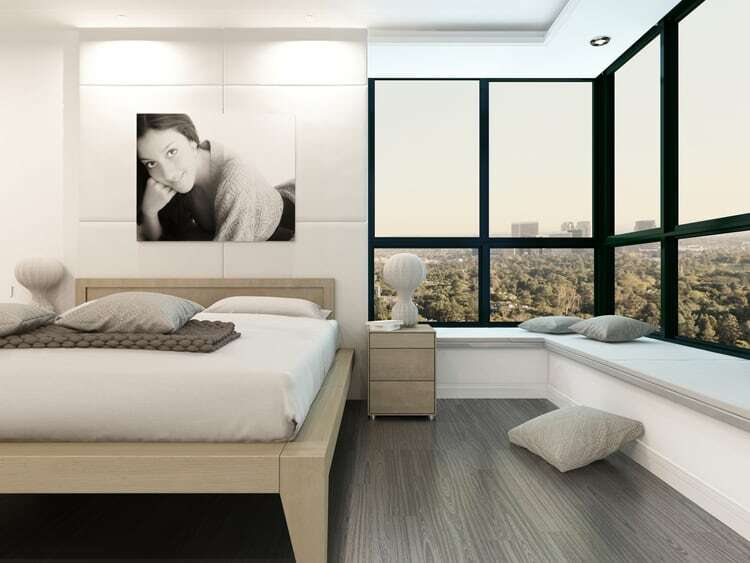 The simple lines and reflect the room’s contemporary style and clean look. 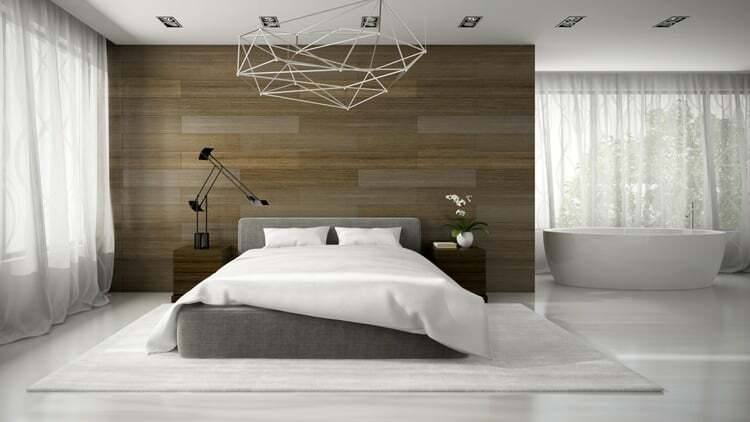 Natural wood paneling gives this white master bedroom a rugged feel that looks stylish but can be too harsh if not done properly. In this case, some of the boards were visually lightened with a whitewash of glaze and paint. 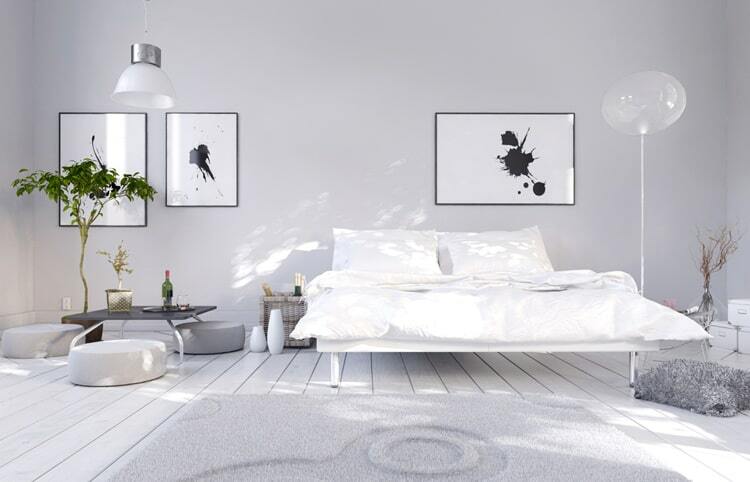 Use white to highlight your bedroom’s greatest assets. In this master space, the designer focused on the architectural headboard wall with bands of subtle backlighting. Other sources of lighting, like the bedside lamps, wall sconce and modern pendant add visual warmth to the other white furnishings. 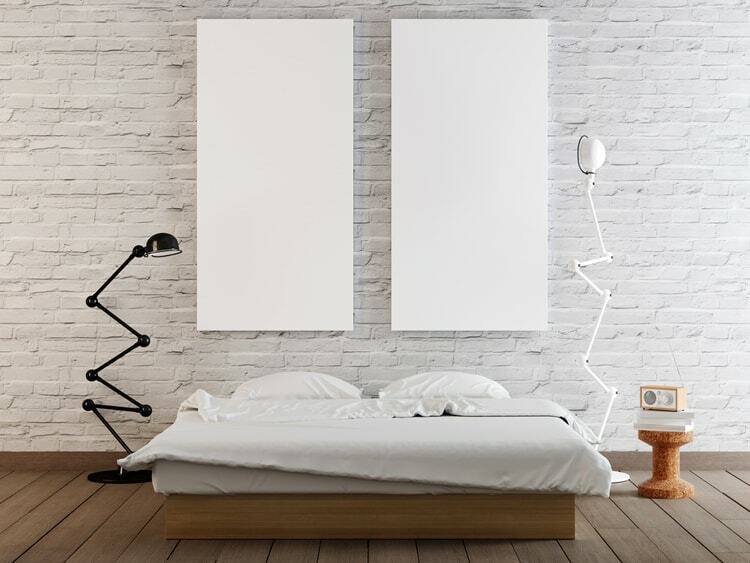 In this minimal, white master bedroom, the owner created a gallery-like wall with two oversized blank canvases. They’re absolutely perfect placed against the painted brick wall. The carefully selected furnishings like the platform bed, industrial floor lamps and spool side table keep things interesting and real. This combination master bedroom and dressing room is a dream come true. This luxe look was created by using a monochrome palette consisting of white walls, an overstuffed bedframe, a white leather bench and artwork with a bold splash of color. Create a distinctly feminine vibe with a white-on-white color scheme. This spacious master bedroom features sheer, flowing curtains, Irish linen bedding, antique white furniture and romantic wall sconces that are period to the home. 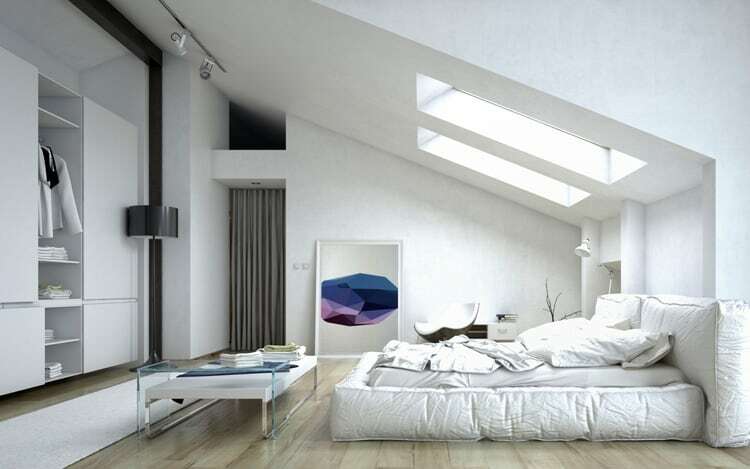 A great way to showcase a white master bedroom is to emphasize contrasts. This prevents your white bedroom from looked washed out and lifeless. The warm wood flooring, wardrobe and pivoting door to the en-suite give the space a rustic, cottage-inspired feel. The tufted natural linen headboard provides another layer of texture and color. White is the perfect color to expand the look of a cramped space. In this tiny master bedroom, bright white walls, furniture and accessories reflect natural light, making the entire room feel much more open and spacious. The dresser mirror and mercury glass lamps add a reflective quality that also makes the space feel larger. 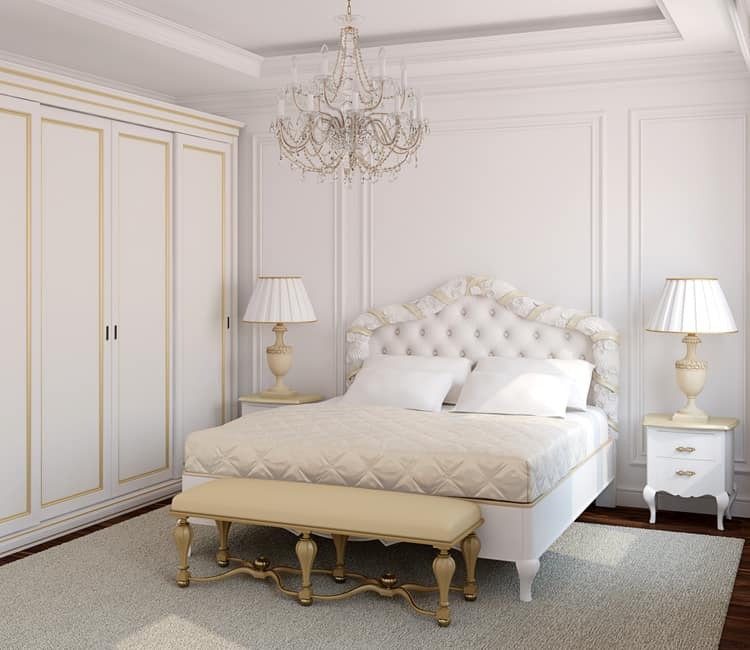 This master bedroom in creamy white is definitely suited for royalty. Make your bedroom extra relaxing by layering varying shades of white. In this space, different tones from cream to almost butter yellow mix to create an opulent retreat fit for a queen. Tailored upholstery in rich black leather and sumptuous white bed linens create a contemporary look in this predominately white bedroom. Swirling twin chandeliers and a massive floor mirror were added to give the space an artistic vibe. The master bedroom in this renovated farmhouse combines clean white walls, beautiful bedding and pale accent colors to freshen up the once drab space. The owner used elements like a crystal chandelier, antique furnishings and lime washed wood flooring to add interest and texture. If you’ve ever tried it, you know a white color palette can be tricky to pull off. 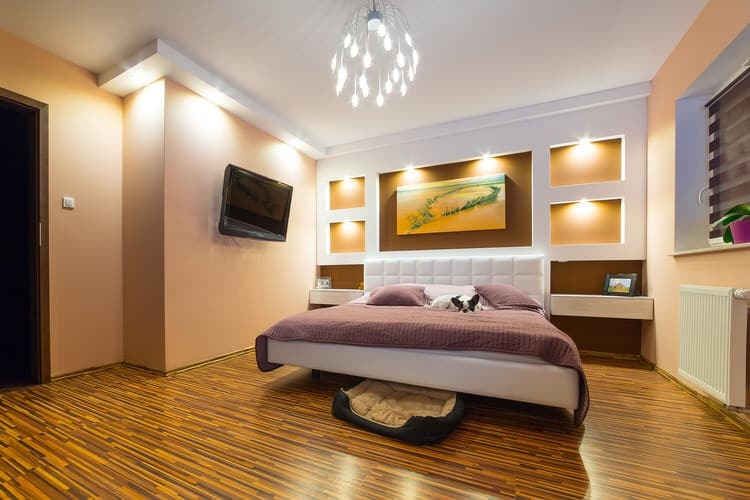 With a few smart tips you can make it work in your master bedroom. Keep the majority of the room the same shade. Use subtle variations of white to add depth. Inject texture with bedding, rugs and window treatments. Mirrored pieces can also be used to break up the white expanses without interfering with the neutral palette. 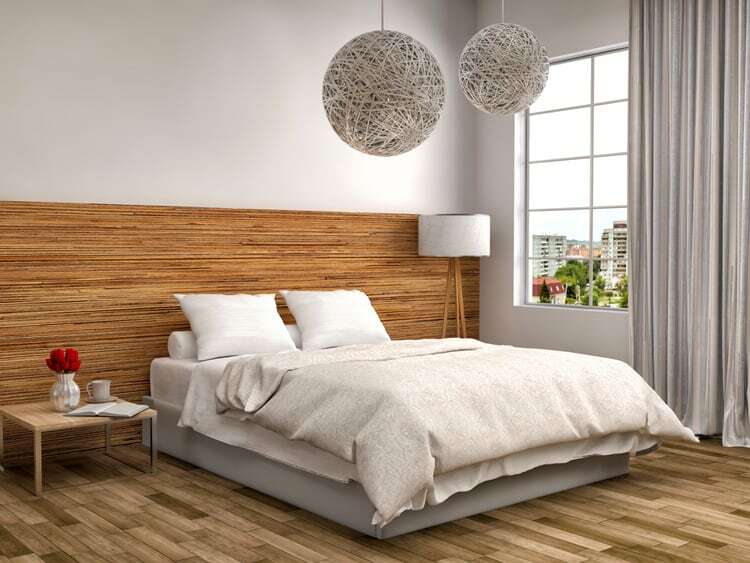 You don’t have to spend a fortune to add beautiful wood tones to your white master bedroom. In this example, the homeowner chose faux bois wallpaper to create a dramatic headboard wall. The unfinished wood side table was a bargain from IKEA and the wood flooring is actually vinyl plank flooring that looks just like the real thing. 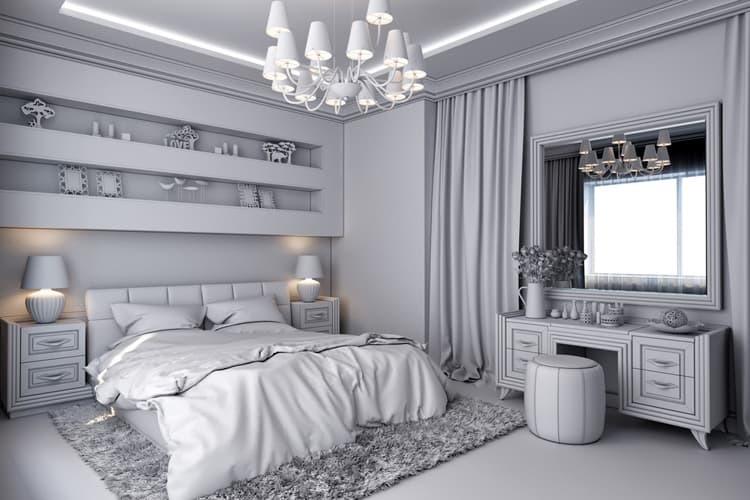 White is a classic palette for any master bedroom, but using it throughout the room can make it feel cold and impersonal. This savvy designer chose a fluffy shag rug, a huge mirror and luxurious curtains and bed linens to combat the white-out look. The wall shelves are another smart detail to create additional storage and break up the white wall. This gorgeous master bedroom perched high above the treetops is decked out in white, but incorporates a variety of furnishings to create a warm and inviting atmosphere. The windows flood the room with natural light and the various wood tones and the graphic artwork give the room a personal touch. 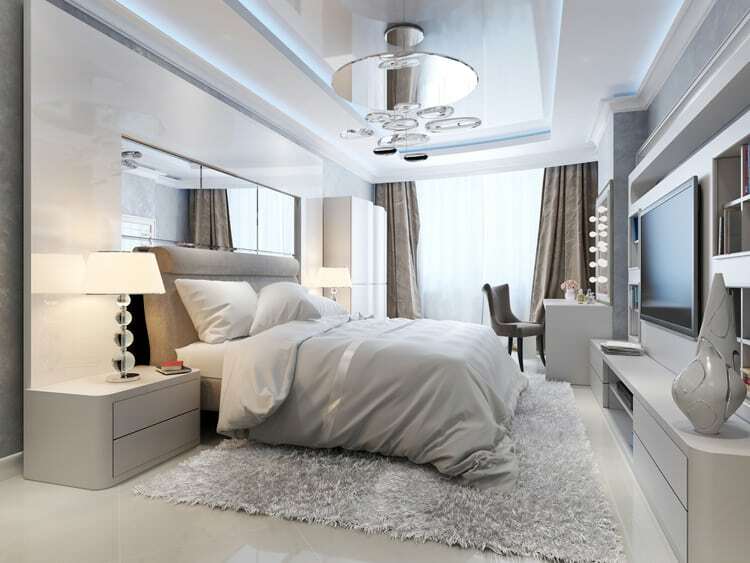 There’s nothing more daunting than decorating a massive master bedroom in white. This space could have been an epic fail, but the designer knew just what to do. To perk up the white box, he designed floor-to-ceiling wood paneled closets on either side of a massive mirror. The shot of color breaks up the space and gives it a chic and contemporary air.